Folks have been wondering what these Wyoming state-run feedlots look like. 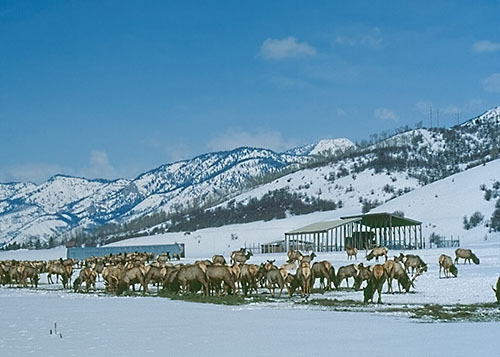 The photo is of the Grays River feedlot, a few miles south of Alpine, WY and near the Idaho border (menace to Idaho elk). This small feedlot is right next to a busy highway and it has a fence on 3 sides. The photo shows the foothills of the Salt River mountain range in the background. That’s the unfenced side. The percentage of the elk that test postitive for brucellosis here is very high. Notice they are eating hay which they stand on, defecate on, and abort calves on, a very good way to spread disease. Thanks for the picture of Greys River FG. And this is quite sanitary compared to some of them, like Muddy Feedground, where the erstwhile “test & slaughter” program is going on. Sometime, go up to Forest Park FG, up river from the Greys River FG, and check it out. Where’s the stock tank? And the barbed wire fence with cattle guard? Reminds me of the average Pennsylvania state fish hatchery. The only thing missing in the photo is the stream of effluent.